What will you be up to on Valentine's Day? The Mainland church of Godman Akinlabi's Elevation Church will be holding a special Valentine day's event. 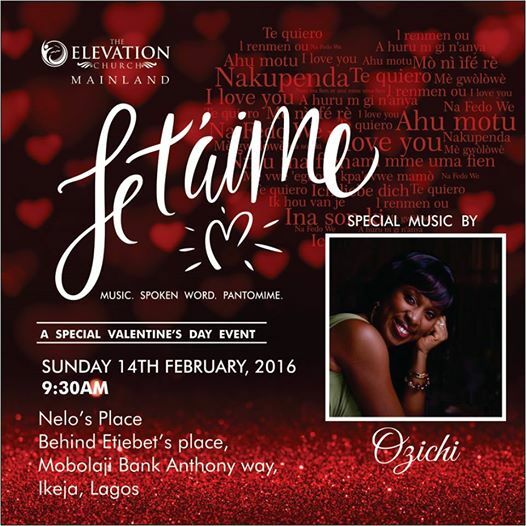 Don't miss 'Je t'aime' happening on Sunday, 14th February 2016 with the beautiful and talented, Ozichi. Venue: Nelo's Place, behind Etiebet's Place, Mobolaji Bank Anthony way, Ikeja, Lagos.